Should I download any software to use 'Hippo Video'? Why do you ask for so many permissions when I add the extension? How to integrate with Zendesk? What are video tickets? Where do I find them? Is there a limit to how long I can record? What happens when I record past recording limit? Will I lose the recorded videos after the trial version ends? How to test the working of audio and webcam from Chrome Extension? How to activate/deactivate users in Hippo Video? How to record high quality videos? How to edit in Hippo Video? How can I delete a recorded video? How do I remove the branding that appear at the end of videos? How to add intro/outro track to a video? Can I crop a video? How can I cut my video? Where do I find my videos? Can I upload my video on YouTube? How do I record a single tab or an application? Will I lose my data if the internet failed while recording? Hippo Video comes as a Chrome Extension. Install Hippo Video from the Chrome Web Store and start recording. 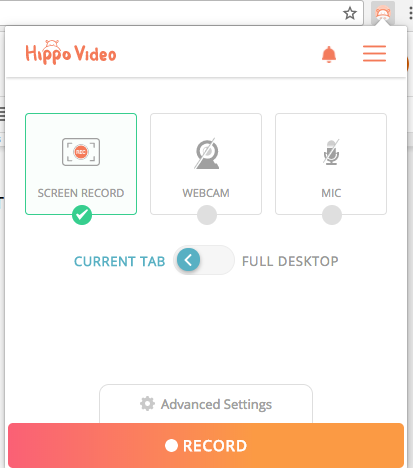 In case you added Hippo Video from the web, you can record using the ‘AUDIO’ and ‘WEBCAM’ options. The Chrome Extension is required for ‘SCREEN RECORD’. Select ‘RECORD’ when you’re ready to take a video. Clicking on 'FINISH RECORDING' ends your video. You can edit, ‘SHARE’ and ‘EXPORT’ your video. No. Hippo Video comes as a Chrome Extension. All you have to do is install the Chrome Extension and start recording your video. Since Hippo Video comes with a chrome extension there is a need to communicate with the Google Chrome API. To do so, Google Chrome needs access to some permissions. When you install and add Hippo Video to your chrome extension, you might notice a popup like the one displayed below. This permission sounds scary, the way it is phrased. However, it is one of the basic permissions that Google Chrome requires for a chrome extension. We don’t read or change any data you browse. This permission is helpful for you to keep you informed about the progress of the recording. It offers you the best experience through notifications when working in the background. This permission is only used to know the status and working of the chrome extension. In order to record your screen, Hippo Video requires this permission. Webcam permission lets you record a video with a webcam. Click on the chrome extension and sign up. As soon as you log in to your account, choose your role and proceed to record videos. Your privacy is first priority, and we’re trying our best to ask you for as little information as we can. If you have any questions or would like some more details, please write to support@hippovideo.io and we’ll be happy to help you out. 4. How to integrate Freshdesk with Hippo video? Step 1: Go to your Freshdesk account and click on your profile avatar. You can find your API token under profile settings. Step 2: Once you copy your API token, go to settings and select 'Apps'. Step 3: Search for Hippo Video app and paste the API key in the space provided. Click on ‘Install’. Once you are done, you can go to your tickets tab and check for the Hippo Video widget. If the app is integrated, you should be able to record a video or select the videos which are already recorded inside Freshdesk. Go to Zendesk dashboard and click on settings. Select Marketplace under ‘Apps’ and search for ‘Hippo Video’ in the search bar. Once you are done installing Hippo Video, you just need to provide your Zendesk API Token to get started. 6. How to share videos to Zendesk from Hippo Video? Step 1: Create a new video or choose the one which is already recorded. Step 2: Select your video and click on ‘SHARE’. Step 3: You can see various sharing options, select ‘ZENDESK’. Step 4: Now choose ‘Add Article’ to send your video as an article. Step 5: Choose your category and section to where you want to import your video in Zendesk and add a title to your video. Step 6: Click on ‘POST’. You can check your video in Zendesk under selected category and section. 7. What are video tickets? Where do I find them? Video tickets allow your customers to record their issues as a video and share. Click on the ‘TICKETS’ located on the top bar. Copy the link available to share it with your customers. Using the link, customers can record a video without having to create an account with Hippo Video. Also, you can check the status of your customer issues from your account. Any issues encountered by customers can be quickly resolved with video tickets. 8. Is there a limit to how long I can record? You can record unlimited videos for a duration of 5 min/video in a free plan and 2 hours/video in premium plans. 9. How long does a video take to process? The video processing time depends on the length or size of the video. In most of the cases where there is a decent bandwidth the video processing time is just a few seconds. In case your internet fluctuates while recording you might face an error, and the video may not be recorded. 10. What happens when I record past recording limit? Recording stops once the video reaches its limit. Your recording will be automatically saved to ‘LIBRARY’. 11. Will I lose the recorded videos after the trial version ends? Regardless of the trial period or plan you choose, your data will not be deleted unless you delete it on your own. Videos will be available in your library, even after your trial ends. 12. How to test the working of audio and webcam from Chrome Extension? Click on the Hippo chrome extension icon and select the option ‘AUDIO’. Try to talk, and if the audio is working perfectly then, you can notice the change in the range of frequency from high to low and vice versa. --> Audio can be given directly or with an internal mic. Now select ‘WEBCAM’ from Hippo icon then if you can see yourself on the screen - your camera passed the test. If you are unsuccessful, then there might be some issue with your webcam try resolving it and check again. --> You can set the quality of the video from the options available in Chrome Extension. 13. How to create a video presentation? With Hippo Video, you can record your presentation directly from the Google Slides. Your video will be automatically saved to your Hippo Video library. Step 1: Go to Google Slides and choose your presentation. Step 2: Click on the button, which is available above your presentation. Step 3: Select the input capture type and proceed to next. 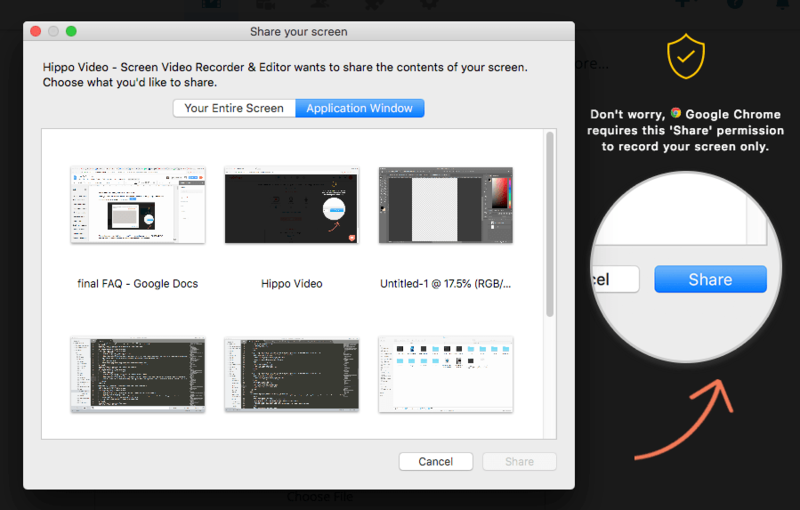 Step 4: Choose to record the entire screen or specific application window. Step 5: Clicking on ‘START RECORDING’ begins to record your video presentation. Step 6: To end the video presentation click on ‘FINISH’ from Chrome Extension. 14. How to activate/deactivate users in Hippo Video? A list of your users appears on the screen. Each user has a menu icon to their right, which has edit, activate/deactivate, reset password and re-invite options. 15. How to record high quality videos? The highest resolution we offer is 1080p. In case you're working on the Free plan you have an option choosing the resolution between 480p & 720p. 16. How to edit a video in Hippo Video? Select a video to edit. Click on the (simple edit) icon, from which you can crop, trim, add text and annotate. 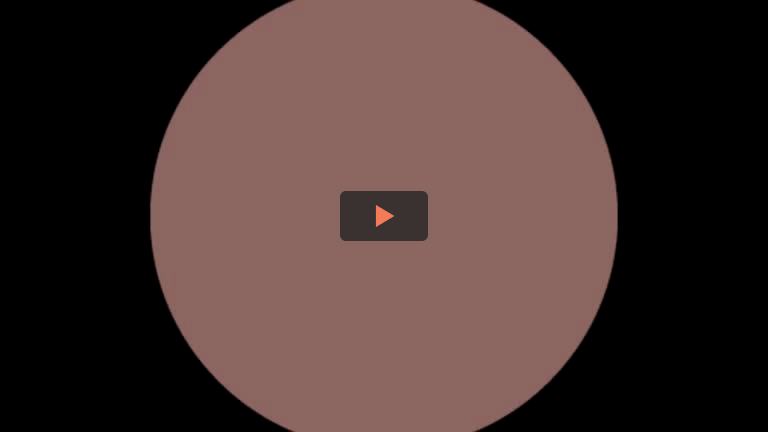 Drag the resize cursor to the area of the video you want to crop, with the help of your mouse. Video can be cropped to any size of your choice. Starting and ending parts of the video can be trimmed using trim option. Slide the bar till where the video needs to be trimmed. Click on ‘T’ icon and add the text in the space provided. Once you ‘Enter’, reposition the text to the place you want it to be visible in the video. 17. How can I delete a recorded video? Go to ‘Library’ where all your videos are saved. Click on the video you wish to delete, click on the (delete) icon from the options listed on the right side of the video preview. Choose 'DELETE' to complete the final step to delete your video, after which your video will be deleted. P.S. You can recover your videos within 48 hours of deletion. Contact us @ support.hippovideo.io to restore your videos. 18. How do I remove the branding that appears at the end of the video? It depends on the plan you have chosen. In PREMIUM plans, all your recordings are free from branding. In the FREE plan, end card will be automatically added to all your videos. 19. How to add intro/outro track to a video? First, Go to ‘EDIT’ and click on which is available below the video preview. Select ‘Import’ and choose your track to add. Once the track is imported, place it on the timeline by dragging. You can cut and edit your track with the tools available inside Pro Edit. Move your track to the beginning of the video if it’s intro and to the ending, in case of an outro. You can also choose to add video clips or music tracks to any part of the video as transitions in between. Finally, click ‘SAVE’ after you edit to attach the tracks to the video. 20. Can I crop a video? In Hippo Video, videos can be cropped to any size from the edit option once the recording is finished. You can also import your videos to edit. 21. How can I cut my video? Select the video you want to cut. Go to ‘Pro Edit’ and play the video to check the portion you want to cut. Click on the (clip cutter) tool and tap on the beginning and ending area of the video you want to cut. Select the clipped portion and press delete. Attach the separated portion of the video and save. 22. Where do I find my recorded videos? You can find your recordings inside the 'LIBRARY' available on the top bar. Click on the icon to access your videos. 23. Can I upload my video to YouTube? Step 1: Select the video to upload and click on the (export) icon, which is available on the right side of the video preview. Step 2: Click on the YouTube icon to share your video. 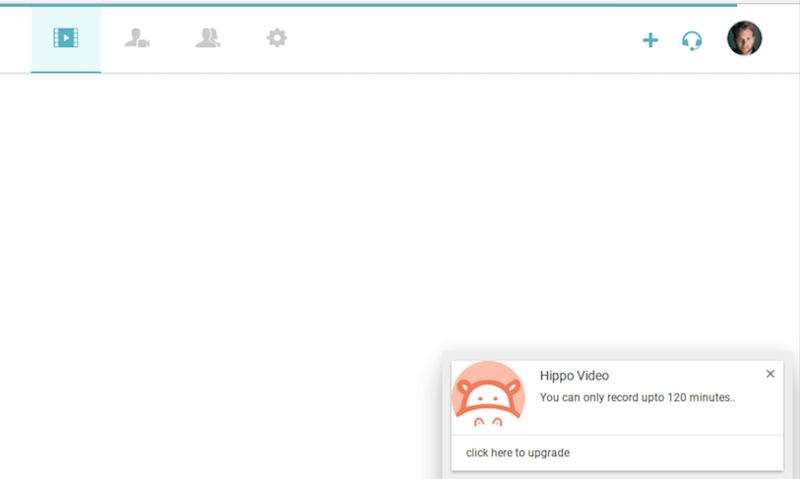 Step 3: Login to your YouTube account and allow permission for Hippo Video to export the video to your account. Once the video is exported successfully, an email will be sent to you. 24. Can I download my videos? Download option is available for all the Hippo Video users. To download a video, mouse over video preview and click on the (download) icon. 25. How do I record a single tab or an application? Alternatively, you can click on the Hippo Video extension and choose ‘CURRENT TAB’. The tab from which you opened the extension is taken as current tab. 26. Will I lose my data if the internet failed while recording? Restarting the browser will help you fix the issue if your browser throws an error. Check your internet connection and make sure it’s consistent. In case, your video is taking time to record, click on ‘Abort’ from the popup. This will help you record a new video when you try again. As an alternative, reinstall your chrome extension or restart your system. Some issues like this are caused by the browser itself and can be resolved by refreshing the page or clearing the browser cache and cookies. Please check if your browser is up to date. We recommend using the latest version of Chrome for better performance. Make sure your browser is in its latest copy by refreshing. If it still doesn’t work then try restarting your system, this will fix the issue in most of the cases. To experience a smooth recording, we recommend you to allow permission for audio and webcam to record. Click on the chrome extension and select ‘Allow Permission’. Now, click on the (Video) icon which is available to the right side of the search bar. At last, choose ‘Continue allowing chrome extension to access your microphone and webcam’ and click on done.